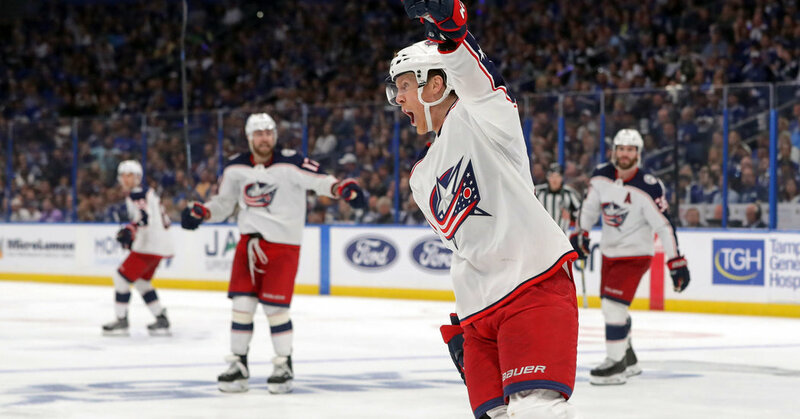 TAMPA, Fla. — Matt Duchene had a goal and three assists, Sergei Bobrovsky made 23 saves, and the Columbus Blue Jackets stunned the Tampa Bay Lightning, 5-1, on Friday night to take a 2-0 first-round series lead. Lightning right wing Nikita Kucherov, who led the N.H.L. with 128 points, was held off the scoresheet for the second consecutive game and picked up tripping, boarding and 10-minute misconduct penalties late in the third period. The Blue Jackets rallied from a three-goal first-period deficit to beat Tampa Bay by 4-3 in Game 1 on Wednesday night as Seth Jones scored the go-ahead goal on the power play to cap Columbus’s three-goal third period. Duchene assisted on both Columbus goals during the first period and put the Blue Jackets ahead, 3-0, on the power play when the center scored on the rebound at 1 minute 28 seconds of the second after Vasilevskiy had stopped his tip-in try. The Lightning made it 3-1 when Sergachev’s shot went into the net off Blue Jackets defenseman Markus Nutivaara’s skate five minutes into the third. But Nash and Panarin scored goals over a three-minute stretch midway through the period. Bobrovsky stopped Kucherov’s shot and got a piece of Steven Stamkos’s scoring chance that also went off the cross bar during an early second-period power play. Duchene stole the puck from J. T. Miller along the left-wing boards and sent a pass into the low slot that Atkinson redirected past Vasilevskiy 5:15 into the game. Werenski made it 2-0 from the blue line after Duchene won a face-off during a power play at 11:44 of the first.